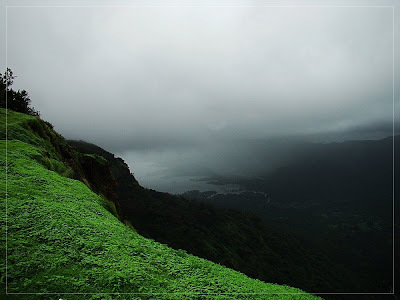 A hill station and an escapade from the urban chores, Matheran stands tall at 800 meters above sea level, and is only about 100 km away from Mumbai. Matheran literally means a jungle on top. With a million visitors each year, it sure is a hot spot for picnic-goers and honeymooners, trekkers and nature enthusiasts. And not just that, but it sure is an abode for a variety of species of birds, reptiles and arthropods. There were landscapes you wont get to see but in monsoon. With waterfalls falling over a hundred feet, and the winds blowing at supersonic speeds, the water was literally thrown back on its own! With a handful of sightings like a Malabar Spotted Flat, Blue Mormon and Red Helen, we also saw a Red Whiskered Bulbul and a Jungle Babbler. The Macaques at Matheran are the only menace. They're very aggressive and never afraid of you. Keep away from 'em! 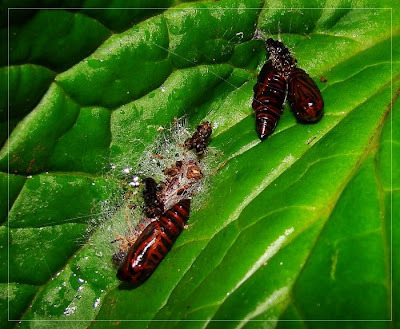 ...and pupae of a moth laying on a leaf surface. 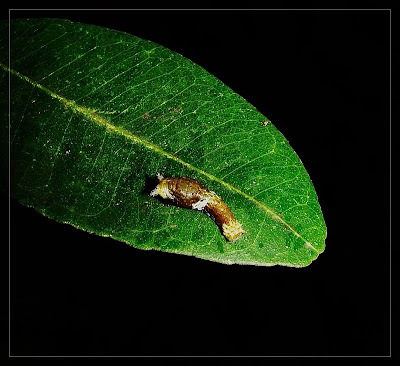 You can also see the remains of the caterpillar alongside. I went on a trail with my fellow classmates, and came back drenched in cold waters, chilly winds and a lot of beautiful landscapes. Although not a good day for sightings, it did blow my mind away with misty peaks and thickest forests. With nothing to repot – as it had been pouring from start to the end – all we did was enjoy the sights, the air and the heavy downpour. None the less, we also saw some dreadful sights that I would like discuss here. Dreadful – and I mean utterly dreadful, murderous and full of deep wounds – dying a perhaps slow death – but… so soon? I’m talking about the earth giving away, columns of mountains tumbling down, torrents cleaving the earth creating deep scars – rather gorges, tourists chocking the forests – literally murdering – with plastics. Did we come to this, to witness a death? 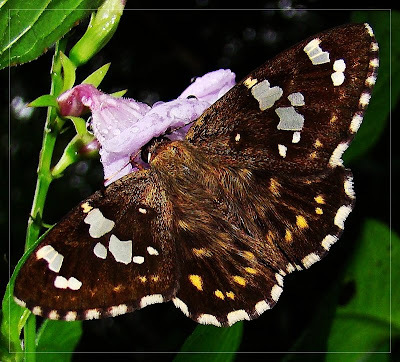 After coming tired and sore, I went through the internet and came across similar reports – rather warnings – with what maybe the doom of Matheran. I read about plastics being banned at Matheran, although there were no checks. I saw people littering the paths, throwing bottles and wrappers. I read about Matheran being an eco-sensitive area – areas which are open for people of all kinds – and they mean drunkards too – compared to the NPs and Sanctuaries. It also means that this area is also vulnerable to ecological degradation. On the other hand, we are witnessing a natural calamity in action. With forests losing its roots from the soil, the mountains are giving away. Landslides are as common as accidents. 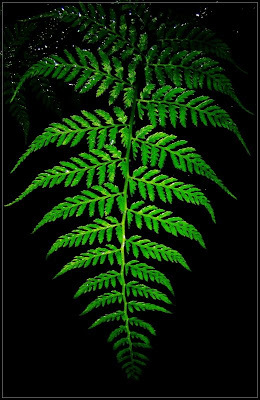 A part collides down every year, bringing down the trees with it, exposing the less fertilized earth beneath. What is the reason behind all this? Deforestation or heavy rains, or something that is yet to be discovered? I have not done a research on that, but they all play their parts. I came across a sight of landslide that uprooted the Matheran train railway tracks (in around 2006). The tracks are rebuilt, and a compound is built that will block future landslides, but that land is yet barren. Only dead tree trunks lay there. Luckily, I did not notice any deforestation on the way; the thick foliage must have covered it. But I saw rain bringing down all the silt in the gutters. Rain with a tea-like color – that of the red laterite soil – dying the water. Of small streams turned into deep gorges. I saw signboards, warning the people of dangers, of landslides and tumbling rocks. All this and that is in the picture since long, and we all are aware of it. What we need now is a solution. With tourism increasing – the construction increases – and that helps in erosion. The anthropogenic assets are alarming than the natural, for we induce the natural calamities. 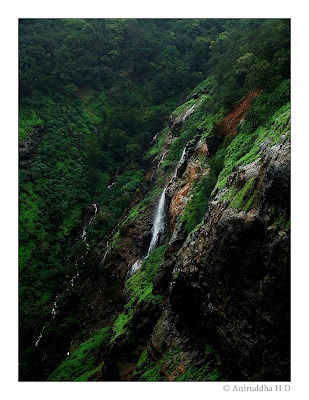 So, do we stop going Matheran? Hell no, we stop people going there from littering and damaging the ecosystem! The only transport at Matheran is hand-pulled carts, and horse-rides. So why not use horse dung that trails all along the path, in making manure for the forests? Why not make houses out of stone and mud, instead of cement and sand? The Matheran tourism is in for a boon, not a doom, if we make it Matheran Eco-tourism. 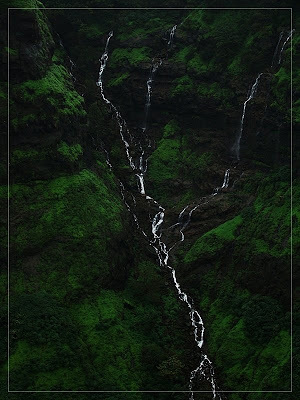 It does not mean that Matheran is not an eco-tourism spot. With nil levels of pollution and ideal weathers all around the year, it sure has maintained an eco-tourism spot from the Britisher’s times. To sum up the rebellious rant, I would like to conclude in a peaceful message. Matheran is clean, cleaner than I put it to be. But it is yet very, very fragile. With all the Cleanliness Drives around the year, it still suffers – and will do so, unless we stop littering. Encourage eco-friendly hotels, for they are the best to provide you with the best, if you want to come close to the real nature. 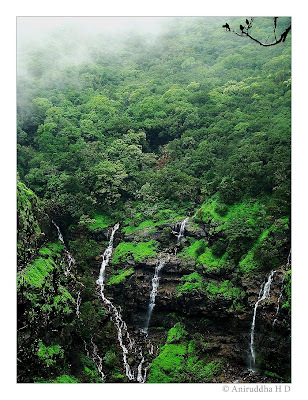 Last but not the least, spreading the message for such an eco-sensitive area is of utmost importance, and is our responsibility to do so, and if you want to go on a nature trail at Matheran, go pre-monsoon or post-monsoon. Mid-monsoon is yet worth experiencing for everyone.